Three Einsett seedless grape vines went in the vineyard on Sunday. We chose this variety because they ripen early, are very productive and have a hint of strawberry flavor. 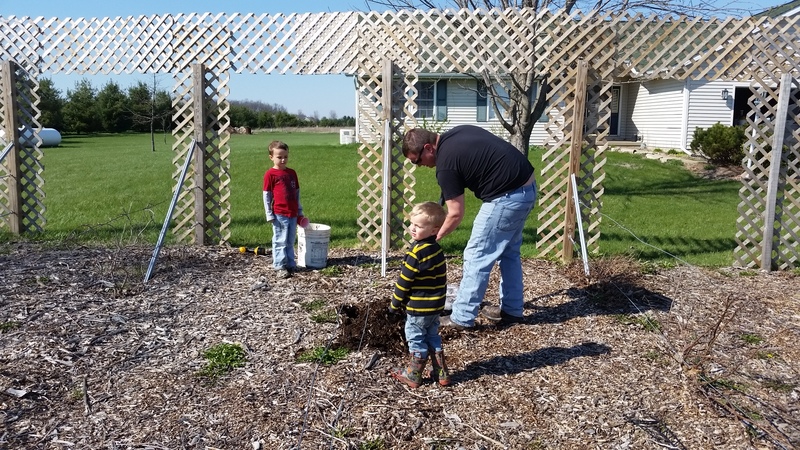 Ray dug the holes, the boys supervised and I mixed up the organic fertilizer. The soil was like butter. The shovel went right through with barely any effort. Just for fun, we dug a hole in the yard to compare. I had to use a ton of elbow grease and the soil itself was not as pretty. It came out in big clay-like clumps that were difficult to break up. The soil that rested beneath a thick layer of mulch was crumbly and the big clumps easily broke up with minimal effort. It is amazing what a layer of mulch does for soil. 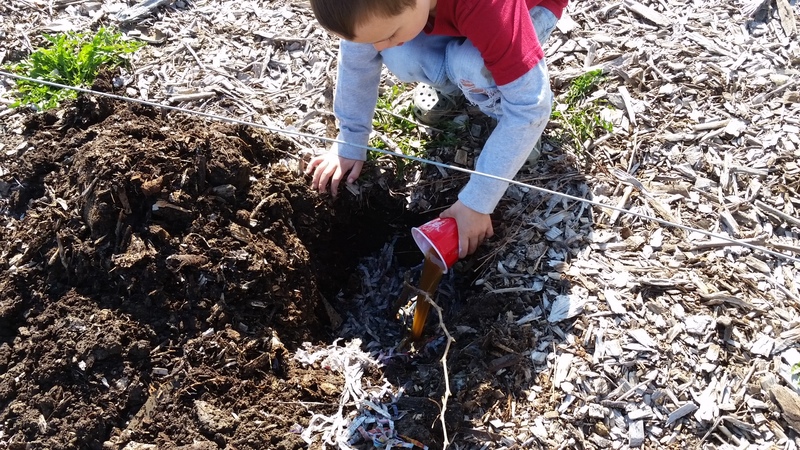 Joe liked pouring the fertilizer over the roots of the newly planted grapes. It’s no surprise that it has an unpleasant smell. With compost, molasses, apple cider vinegar, liquid seaweed and fish oil as the ingredients, it’s going to reek. The plants, however, love it. We used it to try and save the Autumn olives last year and we have two coming back this year. We also used it when planting a few perennials at the end of the season. So far, the hydrangea and currants are the first to sprout. Naturally, we decided to fertilize our new grapes with it too. I know we won’t have fruit this year, but I’m looking forward to eating these yummy grapes. This entry was posted in A to Z Blog Challenge, For the Kids, Garden Stories, Poetry, Writing. Bookmark the permalink. Thank you for the compliment! Four years in and I’m still learning through trials and successes but I’m enjoying every minute of it. Thank you for stopping by and good luck on the challenge!